I have worked for the same company for 27 years. I have been married to the same woman for more than 26 years. I have lived in the same house for 20 years. And I have held the same job position for 19 years. I get longevity. It makes sense to me. But in the very ADD world in which we now live in, I wonder if I'm all alone in this. In times of clarity, I know I am not. Because we celebrate the elongated careers of players like Bartolo Colon and Jamie Moyer. Most of us appreciate longevity even if we can't do longevity. 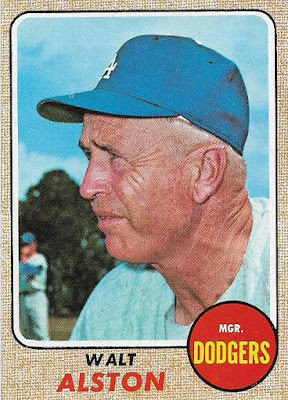 For me, the ultimate test of longevity is surviving as a major league manager. That is some tough sailing. Standards are much too high when it comes to managers. They really don't have that much control over anything, and they take way too much of the blame. It's not surprising that there is so much turnover in the position. Yet, there are managers like Bruce Bochy, Dusty Baker and Mike Scioscia who have found a way to survive. They are our modern symbols of longevity. You can last as a player for as long as your ability holds out. But for a manager, all you can do is gain the trust of someone who controls whether you have a job. Your career hinges on that and the record your players produce. A player has home runs or strikeouts or whatever statistic for support. There is not one measure for a manager that says, "yes, he deserves to be working here another year." The ultimate in managing longevity is Connie Mack. Fifty-three years and 3,731 wins. Tony La Russa and John McGraw are second with 33 years, a full 20 years behind Mack. 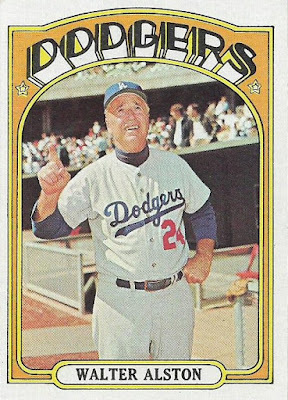 After that it's Bobby Cox, Joe Torre and Bucky Harris at 29. 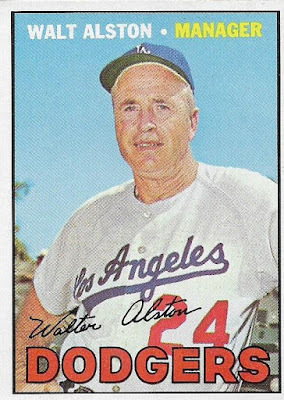 Walter Alston, the Dodgers' manager from 1954-76, is 13th on the list at 23 years. His string of years impressed me very much when I was younger, although he will likely be surpassed by Bochy and maybe some of the other modern guys in the years to come. 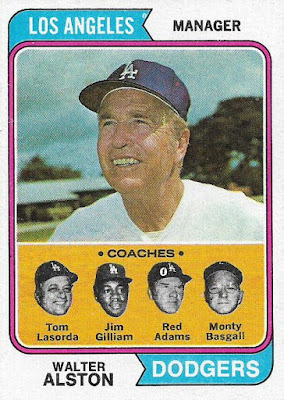 But Alston gets credit for his longevity with one single team, something that some managers like Torre, La Russa and Sparky Anderson can't say. 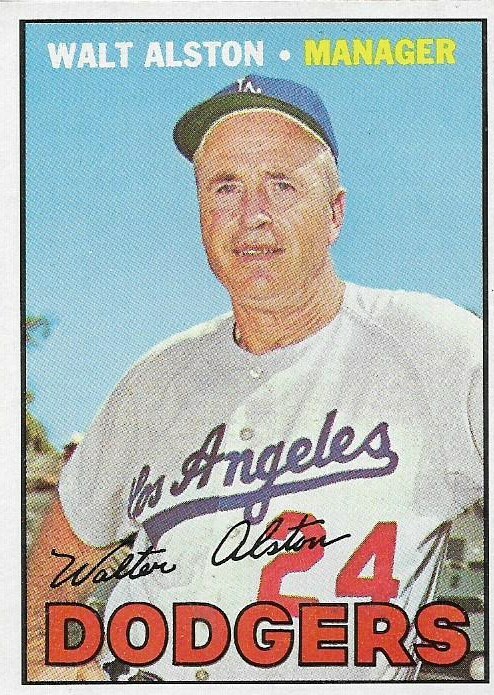 And to bring baseball cards into this, I believe Alston holds the record for the most consecutive appearances by a manager on his own Topps baseball card. 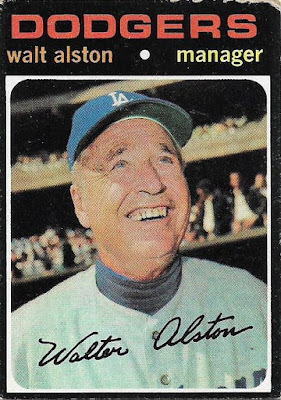 (A quick observation: It took me scanning these cards to realize that the 1969 card of Alston is just the 1967 picture cropped closer). Alston's managing career lined up nicely with the heyday of manager cards in Topps sets. 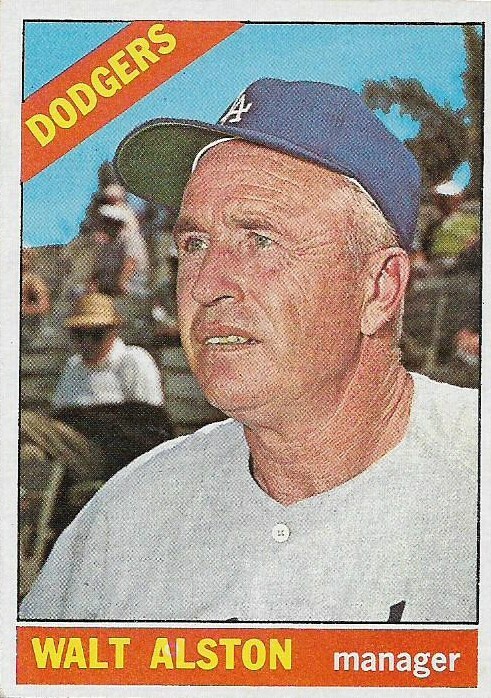 From 1960-74, Topps featured the manager on his own card. 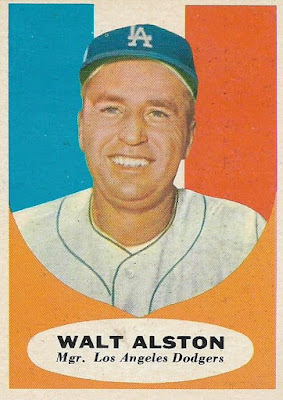 Prior to that, it was very sporadic (Alston shows up in the 1956 set and that's it for that decade, as far as his own card). 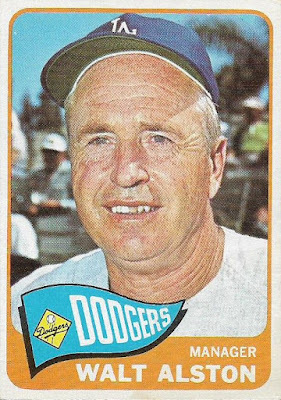 And after 1974, managers were relegated to a tiny mug shot with the team card. 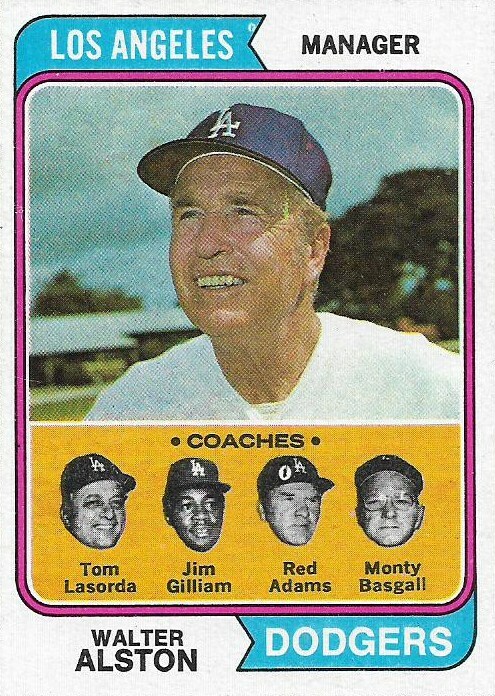 Except for a single year in 1978, Topps didn't return to manager cards until 1983, marking the beginning of a second "golden age" of manager cards, from 1983-92. 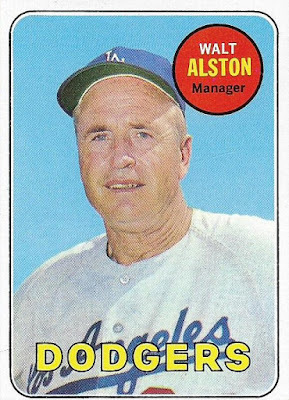 It's Topps' indecision on whether a manager card belongs in the flagship set or not that has kept Alston's record intact for all these years. 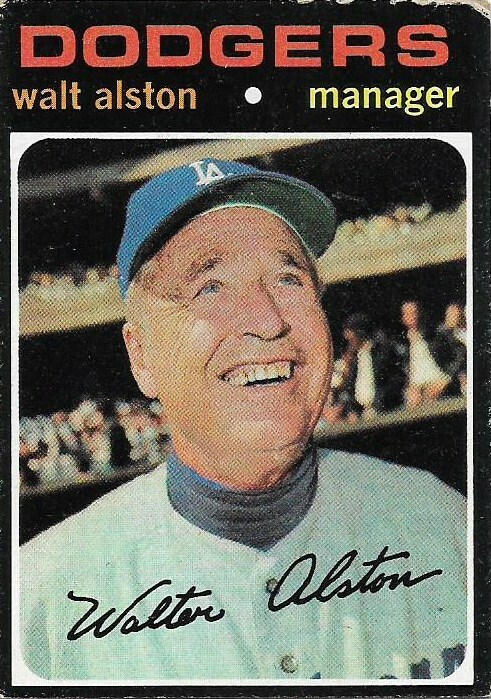 Managers returned to Topps flagship sets again in 2001 and until 2009. But since then, managers have been restricted, for the most part, to Heritage or other "spin-off sets." 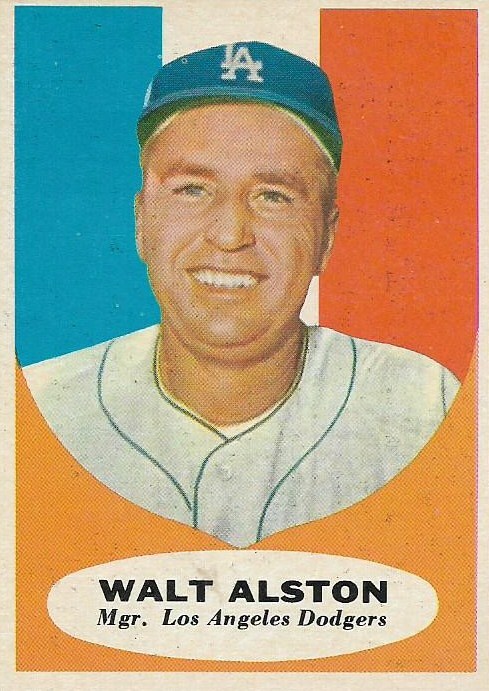 And as for other card companies, they simply couldn't last long enough to produce a manager to match Alston's mark. 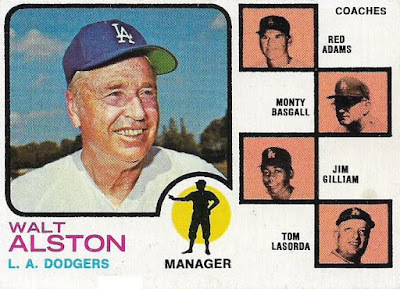 Donruss and Fleer showed managers right from the beginning and then they stopped. 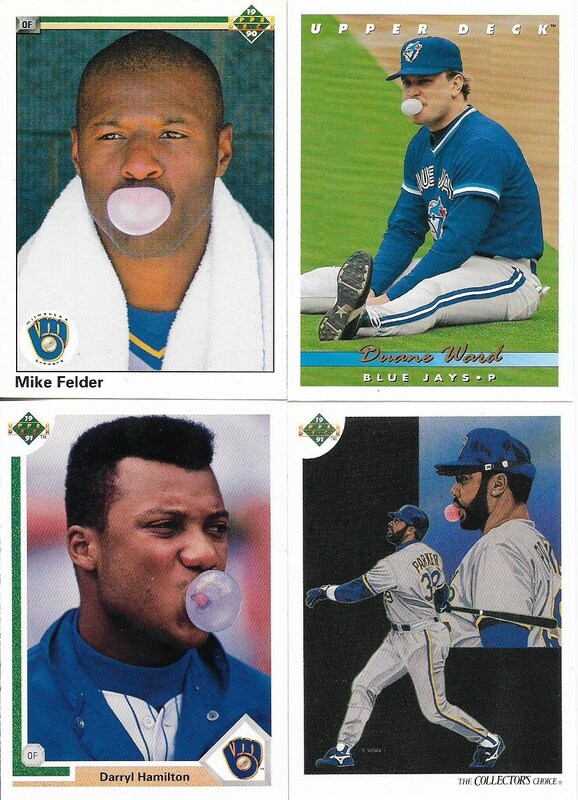 Upper Deck wanted almost nothing to do with current managers except for some brief periods in the mid-1990s. And none of those companies lasted in the baseball card market as long as Topps has. That's another reason why my allegiance is with Topps through every strange and annoying thing that it does. It knows longevity. 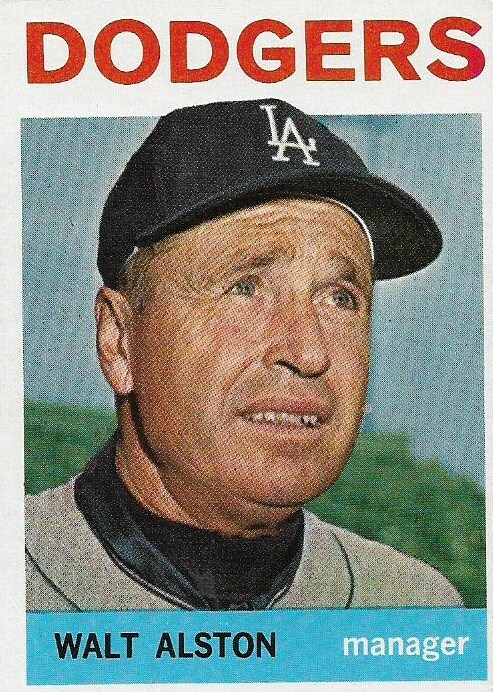 Its cards have been around for 66 years. I get longevity. I appreciate it. And many times, it's a goal unto itself. This blog is over eight years old and in that time I've seen probably more than a 100 blogs start and then disappear. I know I've said hello and goodbye to more than a 100 people at my place of employment. I don't know if longevity is the smartest thing or the most laudable thing. I've just always been a nose-to-the-grindstone guy. As the old saying goes, "keep on keepin on." What I missed while I was "gone"
You've read me whine many times about how busy I am during the month of March. It is annually my busiest month of work. Or at least it used to be. I'm finding that June is quickly surpassing it. I won't go into details, because nobody cares, but the added responsibilities at this time of year over the last couple of years has led to many extra hours on the job. It actually begins in May and didn't end until, well, yesterday. Needless to say, I slept until 1:15 in the afternoon today, which is shocking even for this night owl. During my wildly busy time, I put on a good front on this blog, attempting to sample what was new in the card world. 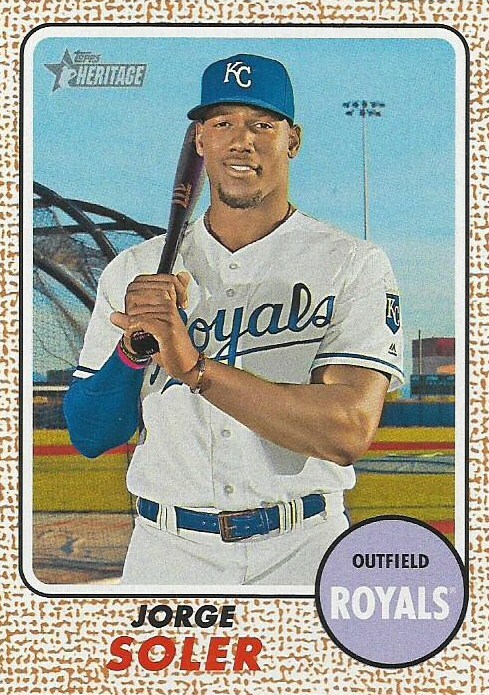 But I didn't focus on it at all and there is much I don't know about everything that has been released during the spring -- Bowman, Bunt, Archives, Series 2 -- I know the basic details only. 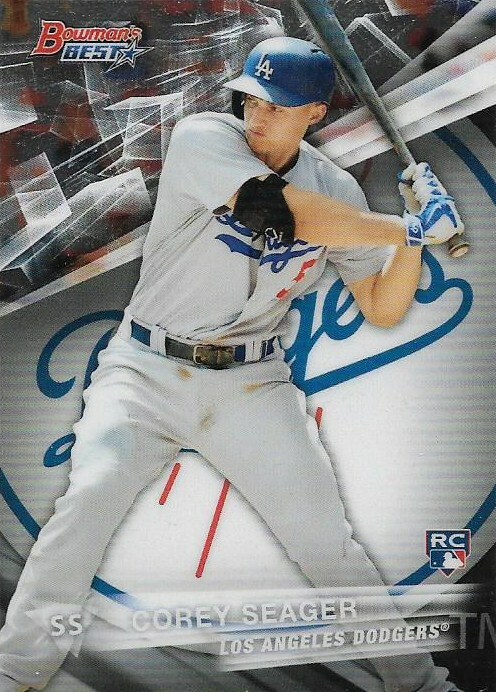 Heck I just got my Dodgers want lists up for Bowman and Archives today. 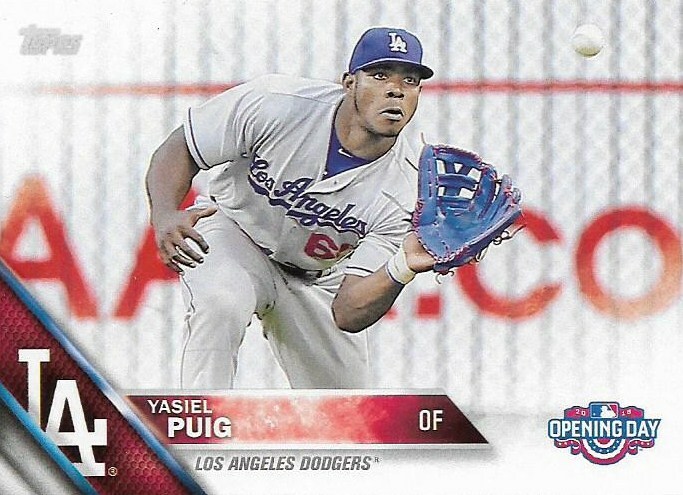 I can't tell you what half the cards that I need from those sets look like, I know little about the inserts, and definitely don't ask me about the variations -- I've pretty much dismissed those from my mind to preserve my sanity. So I am grateful to Cards on Cards for recently sending me some cards (in the above Pinnacle can) that are from the sets that I just mentioned. I can finally absorb -- now that I am not master of ceremonies, caterer and sports editor all in one -- what other collectors have already memorized. I finally have Archives Dodgers in my possession. My lone rack pack purchase of this stuff turned up none and the cards weren't inspiring enough for me to buy more. I'm wondering if the Snider photo isn't actually from his Brooklyn Dodgers days, the cap looks altered. 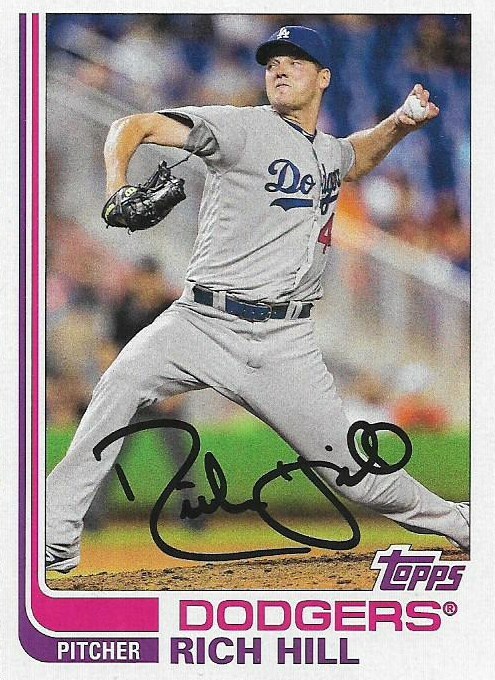 Also, I enjoy that Rich Hill appears to be able to sign his own name. 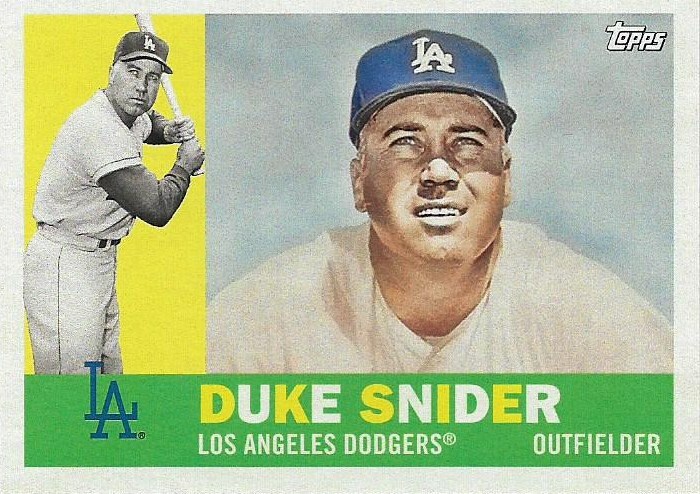 The retro designs expose many modern ballplayers for their terrible penmanship. 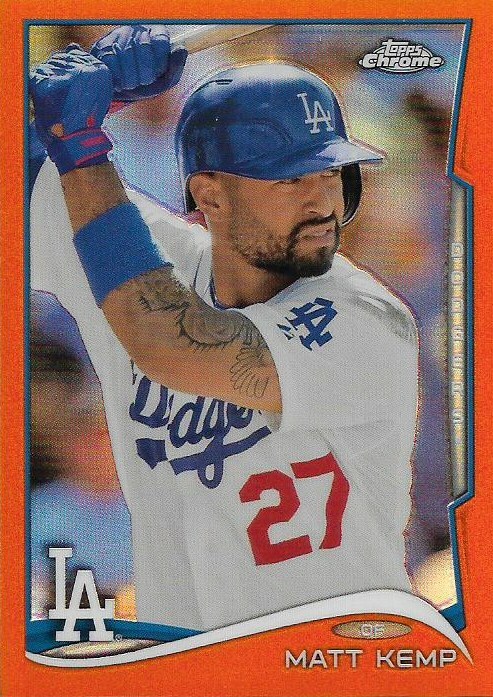 Moving on to Bowman now. I haven't bought any nor even noted whether it's in any of the stores near me. 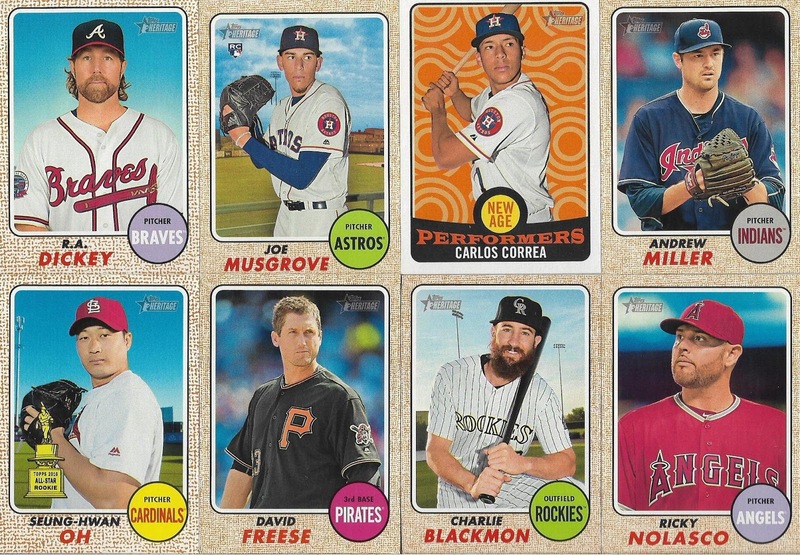 The look of Bowman this year is as uninspiring as ever, almost generic. I don't know how Bowman selects which prospects that appear in the set, May isn't among the top class of Dodgers selections. But it is my first look at him and he scares me. I think he needs more sunlight. 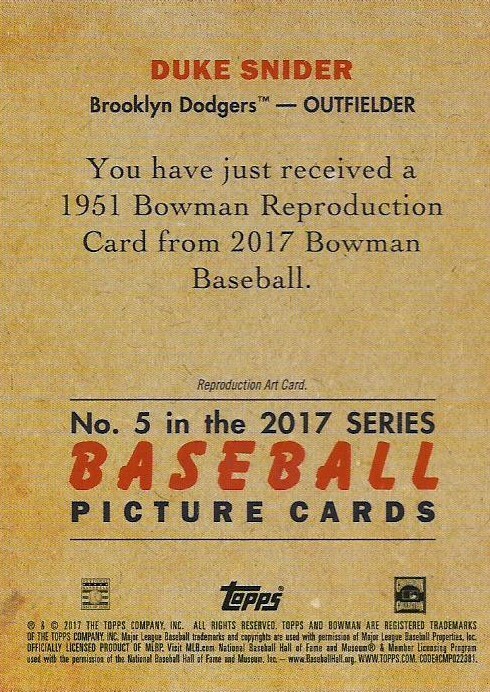 This, I believe, is an insert for Bowman this year, one of the 1951 themes, all chromed up, because there's nothing more natural than a shiny 1951 Bowman card. As you can see, they worked overtime on the back. Gypsy Queen showed up just as I ended one very busy period and started heading into another one. I kind of like the look this year, but as usual wouldn't miss GQ if it disappeared tomorrow. 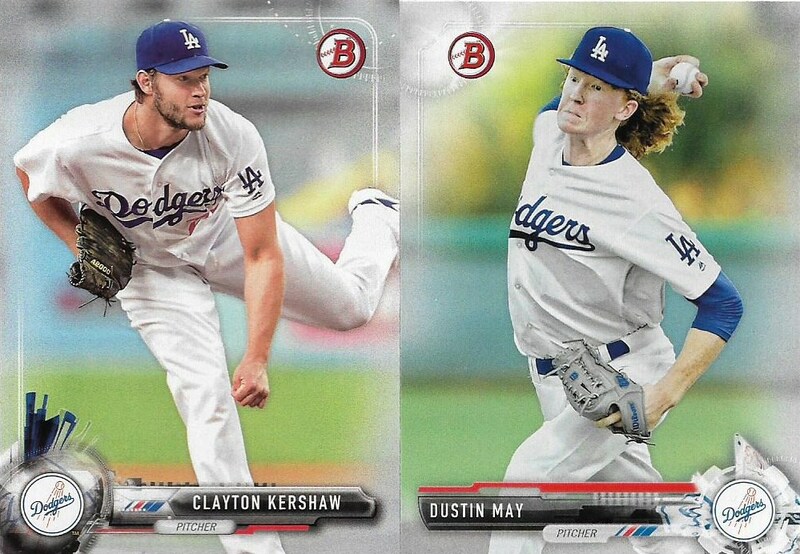 Both of these guys have made no contributions to the Dodgers this season. The Dodgers are like the internet, you don't want to know the disaster behind the scenes that makes it all work. The rest of the cards in the package were made before 2017. Perhaps I know a little more about those. Ugh, sorry about the 2016 flagship. You thought you were done with this design forever. 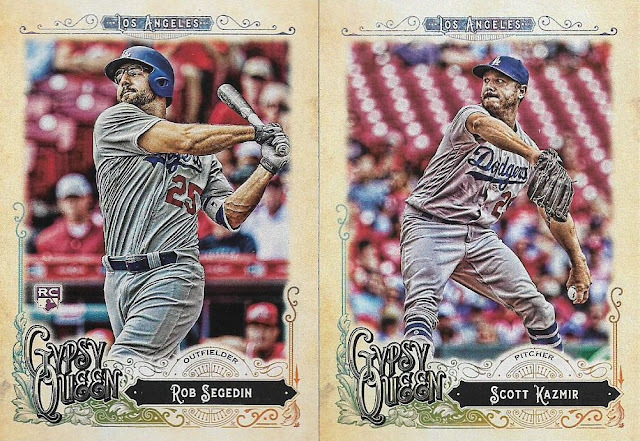 I grouped three different incarnations of the design -- NL team set, foil parallel and Opening Day -- to show how often the same design appears each year and also to get it over with in one shot. Like eating your vegetables first. 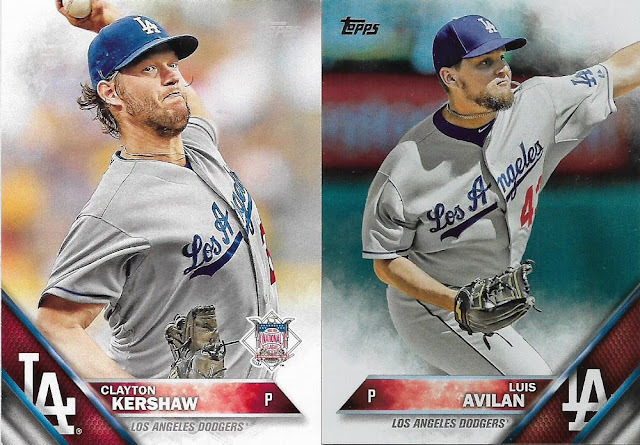 2016 Topps -- it tastes so awful! 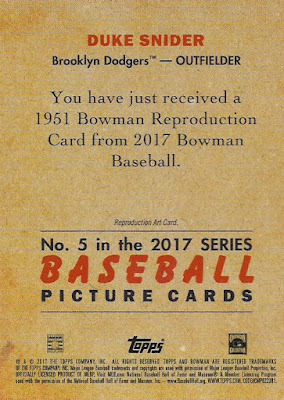 This is a fancy insert from last year's Bowman that Cards On Cards can produce because he has an exclusive Loot Locker subscription. I need to get one of those. If I can get over my fear of pulling nothing but Marlins and Diamondbacks, I might. 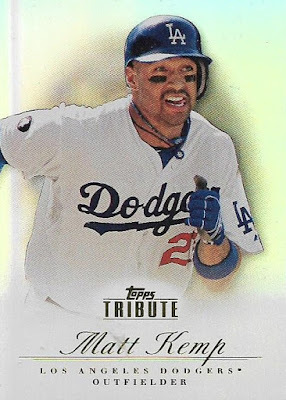 A couple from the glory days of Matt Kemp. I hear he's still doing pretty well for the Braves. But until he has another MVP year and gets the award stolen by a PED cheater, I'm not impressed. 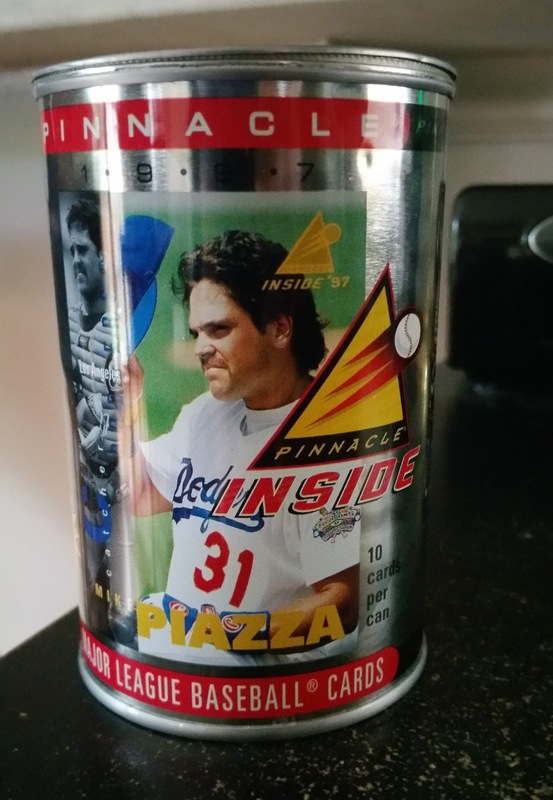 Hey, look, an actual Pinnacle Mike Piazza card that came out of the Pinnacle Mike Piazza can. It's one I need, too. My collection of Piazza inserts far surpass entire double-digit-year careers for players I've accumulated from the '70s and '80s. 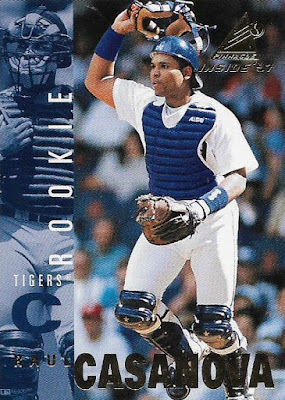 And, sure, what the heck, let's show a Pinnacle Detroit Tiger that arrived with the rest of the cards. I don't know why. I suppose he looks Dodgery, so I'm going with that. It's good to be "back" enough that I can absorb a little more of what's going on in the card world. I don't buy a lot of modern cards these days, they just don't interest me, but I do like to at least be aware of what is available. Sometimes people go to this blog for answers. I have to at least pretend to be paying attention. 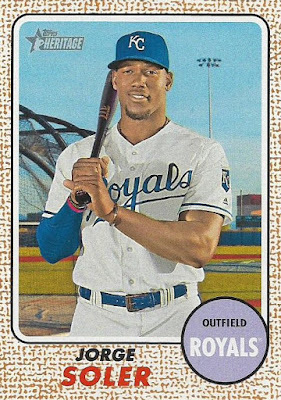 When I was collecting cards as a youngster, every baseball card wrapper contained an offer on the side for something extra. "It's a whole new series of colorful team pennants with official team insignia and colors. Here's a great way to decorate your room. Pick your favorite team or yearly champions! For each pennant send 40¢ plus one baseball wrapper to:"
Most of these, I ignored. I wasn't opening packs to read tiny print on the side. The only time I paid attention was when the offer involved something specific to cards: Collect all the team checklists. Check out the game card inside to win more cards. Those were worth a couple seconds of my time. The ubiquitous Sports Card Locker, which you see in the top image at bottom right, appeared virtually every year on wrappers in the 1970s/early '80s. I probably considering sending away for that once. The personalized trading cards? No way. Nobody needs to see me on a trading card. Even when I was 10. The offer for a baseball autographed by members of your favorite team seems to blow all the other offers out of the water. But, again, I paid it no mind. I was so oblivious to most wrapper offers that I have no recollection of many of the selections from that time. 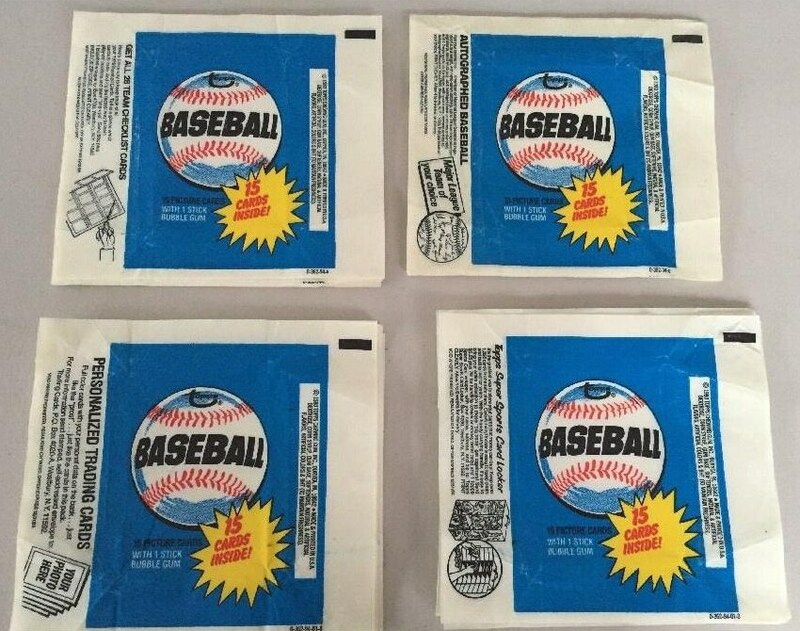 So when mr haverkamp sent me an email asking if I had seen the ebay listing for a 1980 Topps Wax Pack Wrapper Mail Away Ron Cey Box Mint Never Folded, I had to tell him, no, I hadn't seen it, no I never knew that it existed, and, whuuuuuuuut, a Ron Cey box was offered on wrappers to every kid in America??? Yeah, I know, I was all about the cards. But, dammit, night owl, sometimes your focus is too narrow. A week or two later, an envelope arrived from Jim and I pulled out two 1980 Topps Wax Pack Wrapper Mail Away Ron Cey Box Mint Never Foldeds. A couple of things to note about the picture. One, Topps is trying to make Cey look like a generic ball player, which, as you know, is impossible to do with Ron Cey. Two, where the heck did the second half of The Penguin's right leg go? Since mr haverkamp thoughtfully sent me two boxes, I could safely construct one while leaving the other one Mint Never Folded. Kind of neat and nifty and kind of simple and not very exciting, huh? It reminds me of a pack of cigarettes for some reason. Also, the opening without any covering makes me nervous. Cards could just plop right out? 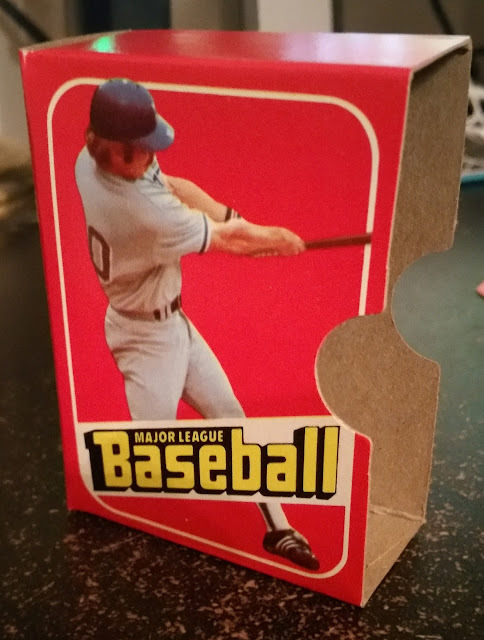 Given that this was issued in 1980 and binders and pages were just starting to become a big thing, I think this new Ron Cey Collecting Box was a bit behind the times already. There is the spine where you can write down the range of card numbers, if you write very small. I admit the box is tidy and cute. I just crammed some cards inside and it holds about 40 cards snugly before you have to worry about the inner fold dinging your cards all up. After doing a little poking around, I figured out that you couldn't order this box off a wrapper from 1980 Topps. 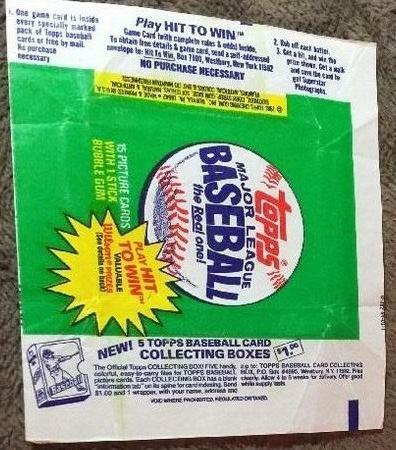 1980 is the copyright on the box, but the wrapper offer appeared in 1981 Topps. 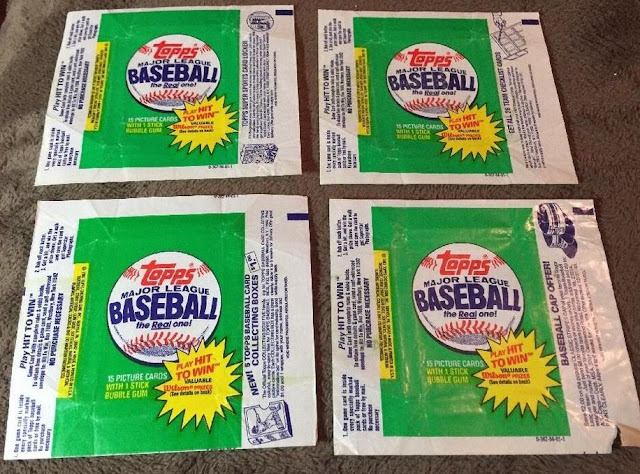 That's a selection of 1981 Topps wrapper offers and the Cey box is on the lower left. According to the offer you received FIVE collecting boxes for a buck. I don't know if Ron Cey was on every one of them, but I'm guessing he was (as he should be). By this time in my life as a collector, I know I was putting all of my cards in binders or shoeboxes and definitely not carrying around 40 cards in a cute little box to school. That kind of thing could get you beat up, Cey or no Cey. But it's a pretty cool collectors item. While I've almost always been about the cards and nothing but the cards, even as a kid refusing to read the wrapper offers, I make exceptions for The Penguin. An item like this ticks all the boxes for my Cey collection. To me, they seem to be one and the same. They go together. That old commercial jingle got it wrong. Apple pie? Who eats apple pie at a ballpark? "Baseball, hot dogs, bubblegum and Chevrolet" is how it should read. For at least as long as Topps and Bowman have been around, there's been gum at the ballpark. 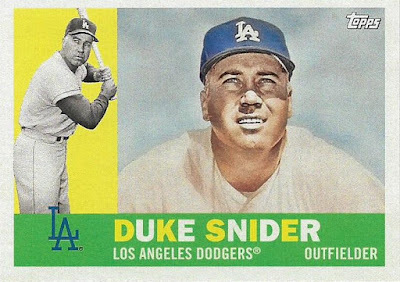 Card companies that also pedaled in gum made sure it was available to players. A player blowing a bubble was considered free advertising. But try to catch a bubblegum bubble on the front of a baseball card prior to the 1970s. I'm almost certain it doesn't exist. 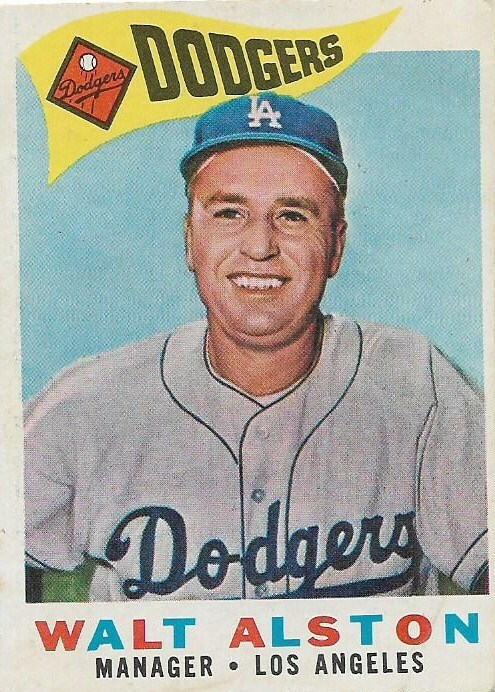 A wad of tobacco chaw in a cheek is much easier to spot on cards between 1951-71. I know, I've looked. There are more tobacco chewers in the first 30 cards of the 1960 Topps set than there are gum chewers in the entire 572 cards that year (2-0 is that score). That is completely ridiculous. Don't we call these little pieces of cardboard "bubblegum cards?" Yet, there was no bubblegum in those pictures? 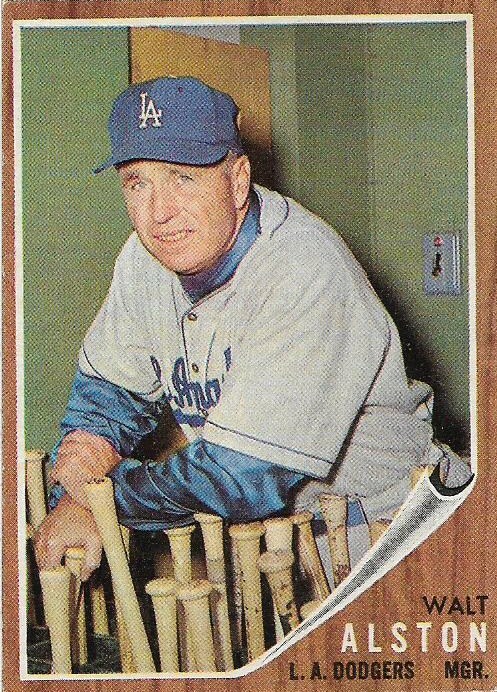 The major reason for that, I believe, is that tobacco simply was the chew of choice for years and years in baseball. 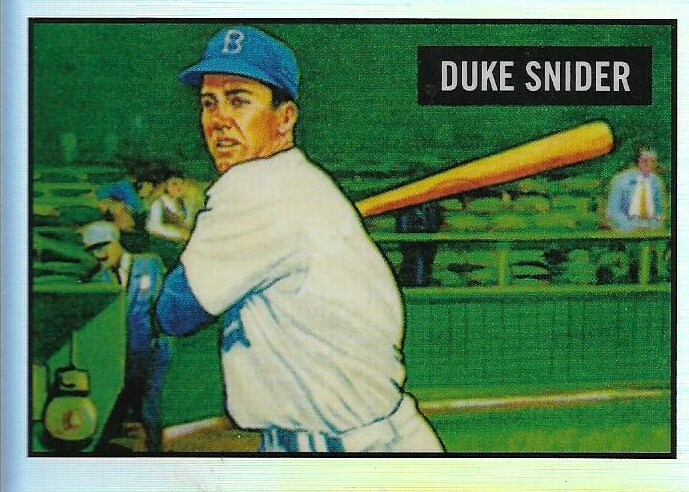 Baseball cards weren't packaged with gum way back when the 20th century was shiny and new. They were packaged with tobacco. Old habits die hard in baseball, even nasty, disgusting, unhealthy ones. You were almost required to chew tobacco to fit in with your teammates. Also, gum-chewing, and especially bubble blowing, was perceived by the baseball crowd as lackadaisical, unfocused, less than serious. Bubble blowing makes a player appear carefree, relaxed. But nobody wanted players to look carefree and relaxed back in the 1950s. Or at least the managers didn't. The late Bob Lemke dug up an article about the bubble blow up that occurred when Mickey Mantle was spotted emitting a pink bubble from his mouth. The media thought it was delightful and Mantle's picture appeared in all the papers. But manager Casey Stengel was enraged. Scandalous! The Mick wasn't taking the game seriously! Today, it's difficult to understand why that was such a big deal. 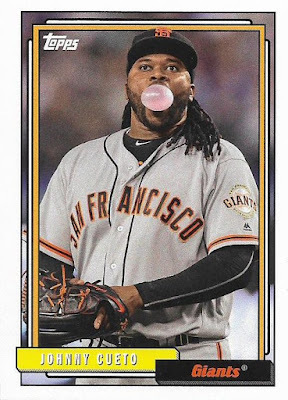 Gum is much more prevalent than tobacco on MLB fields these days and players can be spotted blowing bubbles daily, before cameras and everything. Bubblegum bubbles appear frequently on baseball cards now. Sometimes they are short-printed (a terrible idea, by the way), and sometimes they are included in the regular set. 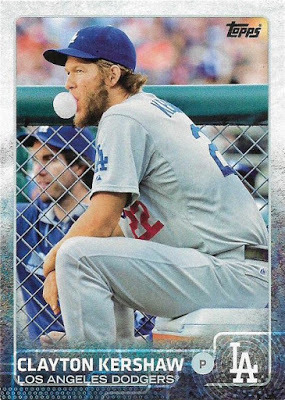 The art of bubble blowing was even made into an insert set in last year's Topps Opening Day set. So when did the change begin? That's what interests me. 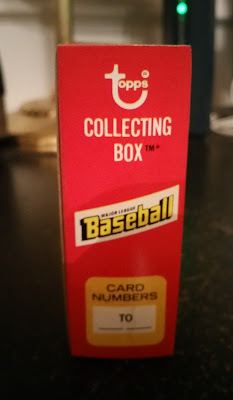 Sure, I know there was no gum on cards for ages and a lot of gum on cards in the last 25 years. But when did it start? On the field, people credit "Big League Chew," the gum product developed in part by former pitcher Jim Bouton in the late 1970s that resembles a tobacco pouch but actually produces shredded gum. Players were weaned off tobacco and onto gum during the '70s. A classic, no doubt. One of the best cards there is, for my bubblegum money. But this is not the first appearance of a bubblegum bubble on a baseball card. 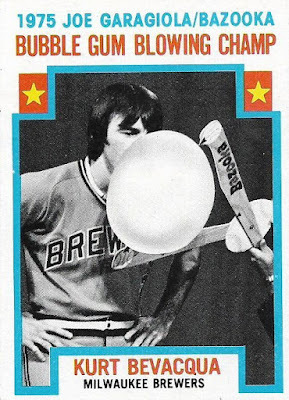 In the 1975 Topps set, Bert Blyleven is shown blowing a bubble in the dugout. It's one of my favorite cards from that entire set. 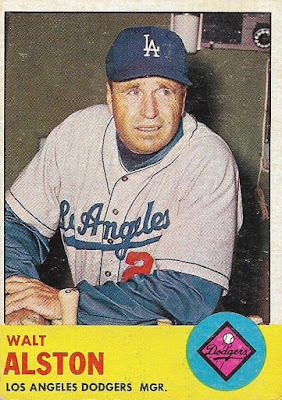 But, still, that isn't the first appearance of a bubblegum bubble on a baseball card. 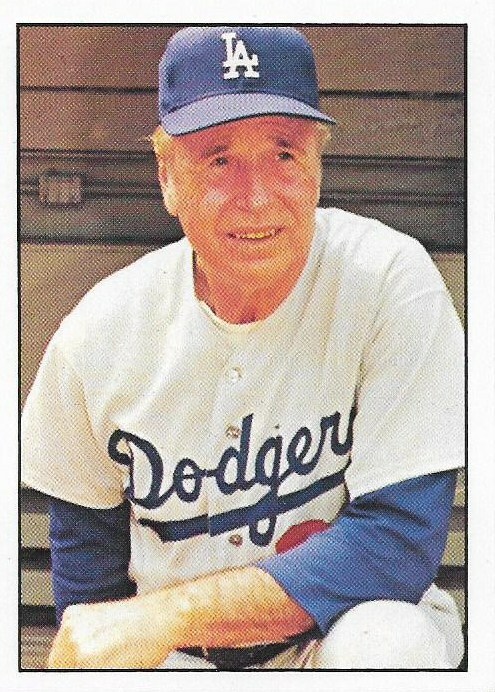 It's Ken Reitz, on his 1974 Topps card (his first solo card, by the way). 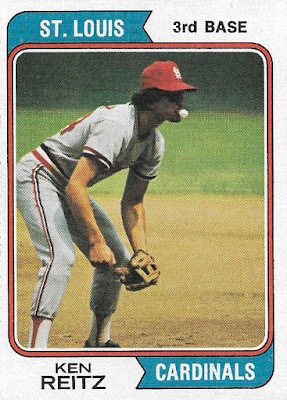 If indeed this is the first moment of a gum bubble being born on a baseball card, I think we owe Ken Reitz a plaque or a trophy or our debt of gratitude or something -- maybe a bucket of Bazooka. Without Mr. Reitz would we have this? Would we have Pinnacle Griffey in '95 or Topps Bevacqua in '76? Would we have Brad Mills in 1982 Fleer or Sean Casey in 2005 Topps? There are many collectors who compile "bubblegum blowers" mini-collections. 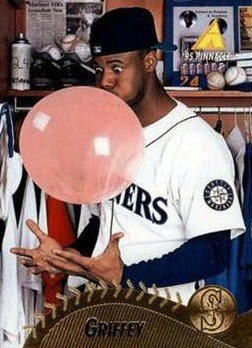 Seeing a player blowing a gum bubble is fun. It is evidence of what we most like about the game -- it's fun. Chewing and spitting and brown stains on your uniform pants? That's not fun. I'm so glad we came around on that. 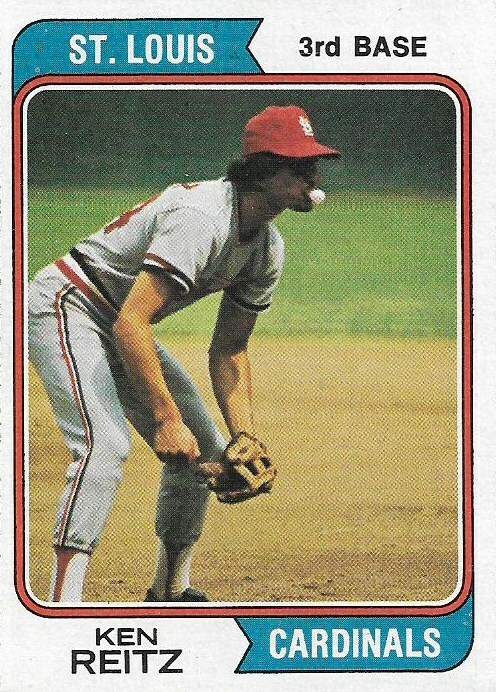 Let's all think of Ken Reitz the next time you see a ballplayer blow a bubblegum bubble. I'm a card collector, so I like to categorize things. And if I were to categorize the 1993 Upper Deck All-Time Heroes set, I would label it as "the classiest most difficult to store retro set of all-time." How's that for a category? The '93 All-Time Heroes set is a tribute to the famed 1912 T202 Hassan Triple Folders, one of the first sets to feature multiple big leaguers on one card. 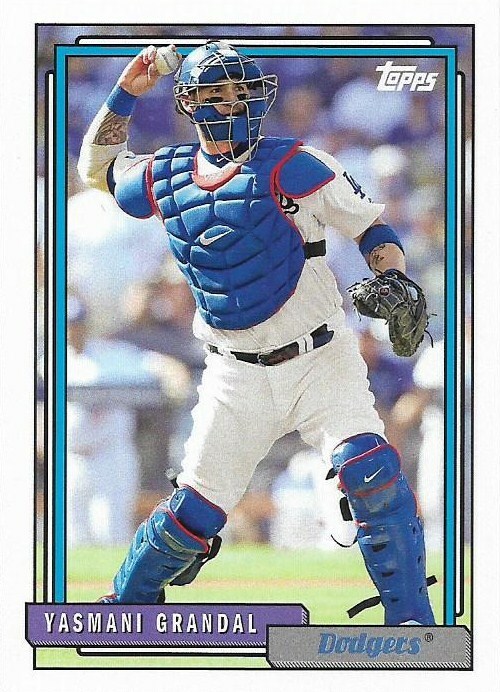 The 1993 UD set is 165 cards and features many players from the past, during a time when retro was just becoming popular with major card companies. It's also one of the few sets to trumpet a cause on the front of each card, promoting the Baseball Assistance Team, formed in 1986. Each card is 5 1/4 inches long, which is not a nice thing to do to a group known for their OCD. Fortunately, there are pages to accommodate these cards. 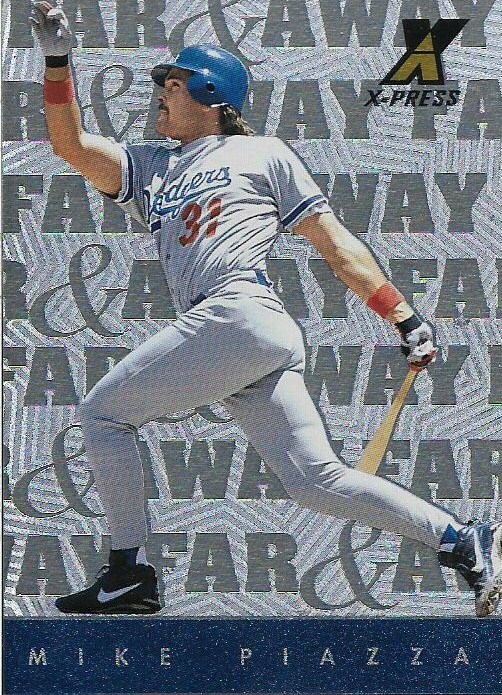 I recently received a few 1993 All-Time Heroes Dodgers from Jeffrey of Cardboard Catastrophes, and they were accompanied by one of the six-pocket pages made specifically for these cards. The Joe Black card, I thought, completed the Dodgers team set for me. 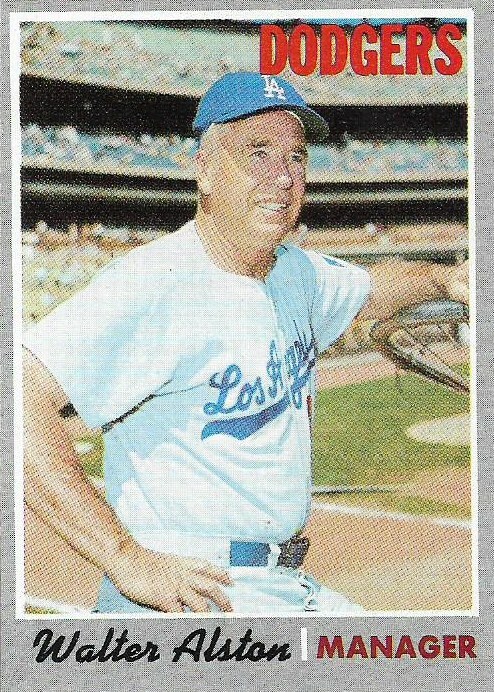 Teamsets4U.com lists eight players for the Dodgers and with Black's addition I had eight. However, the Tommy Davis card in my collection is listed as an Oriole on Teamsets4U. Probably because of Davis wearing an Oriole cap in the portrait photo. But Davis is in action as a Dodger in the center photo, and, let's face it, Tommy Davis was at his most Tommy Davis as a Dodger. So, Dodger he be. 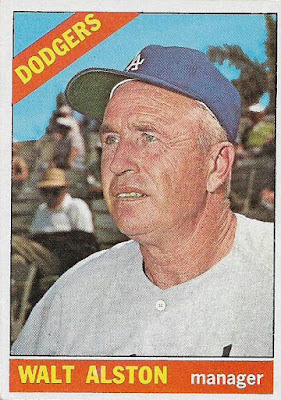 That means I'm still missing one Dodger from the set. It's the Johnny Podres card. Here is a look at the other Dodgers in the set. Carl Erskine, Gil Hodges, Tommy John, Rick Monday, Gil Hodges and Manny Mota. 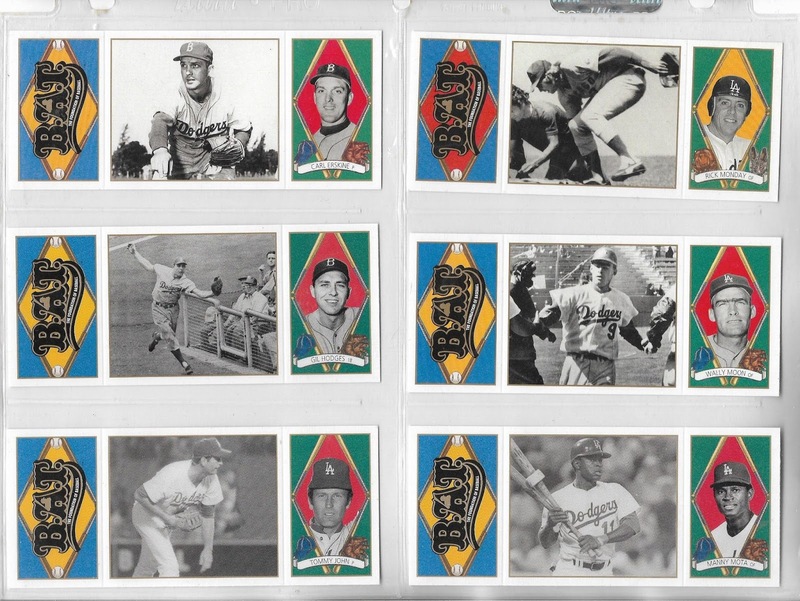 (The center photo of the Monday card shows Monday as a Cub, saving the American flag from being burned by two protestors). The other All-Time Heroes cards that Jeffrey sent are dupes, which means I'm very tempted to fold the sides in on some of those to create the booklet effect that was the key attraction of the original T202 Hassan folders. For now, though, the extra cards are not folded. We collectors with OCD need to move slowly. I received two packs of 2017 Heritage from my daughter for Father's Day. I kind of dropped a hint that we don't need no stinkin' flagship in the house no more and she wisely selected Heritage. The packs were underwhelming. Let's face it, Heritage isn't going to be interesting again until 2020. If I was collecting the set though, they would have been pretty good packs. I pulled just four doubles. 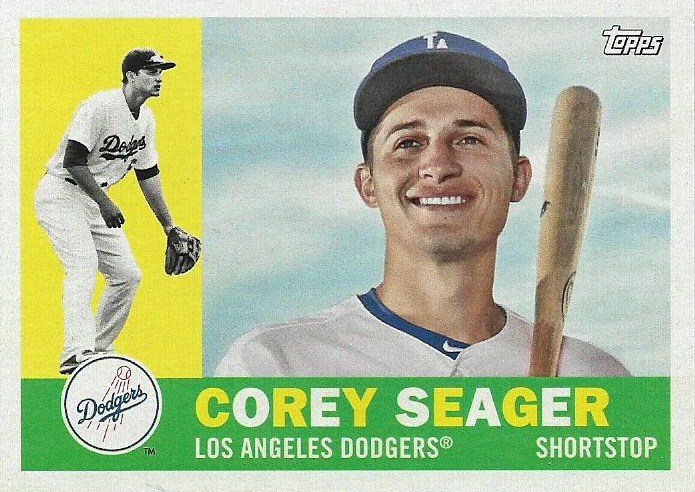 But what I noticed the most from these two packs is how many players are no longer with the teams shown. 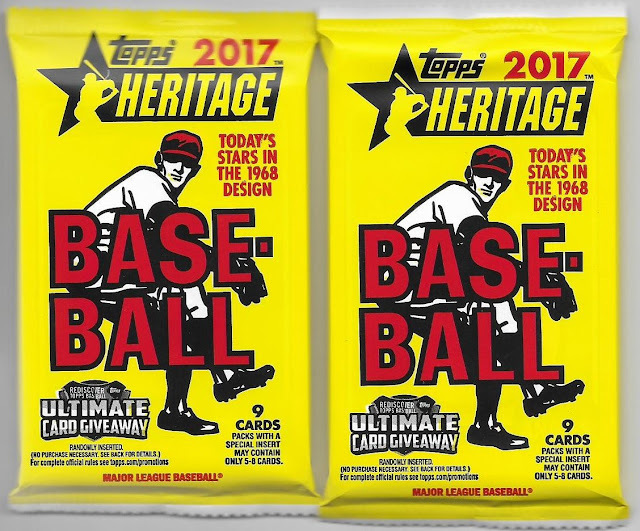 Out of the 18 cards in the two packs, eight players aren't playing for the team Heritage said they were playing for three months ago. It's a tricky situation selecting teams for players, and I get the feeling it's getting trickier all the time. Somebody needs to measure the rate of transactions over the years and see exactly how much it's increased. Jhonny Peralta. 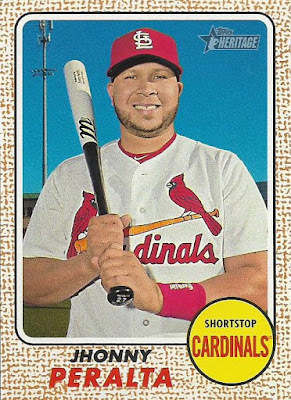 Designated for assignment for the Cardinals. Just signed to a minor league deal by the Red Sox today. Jeanmar Gomez. 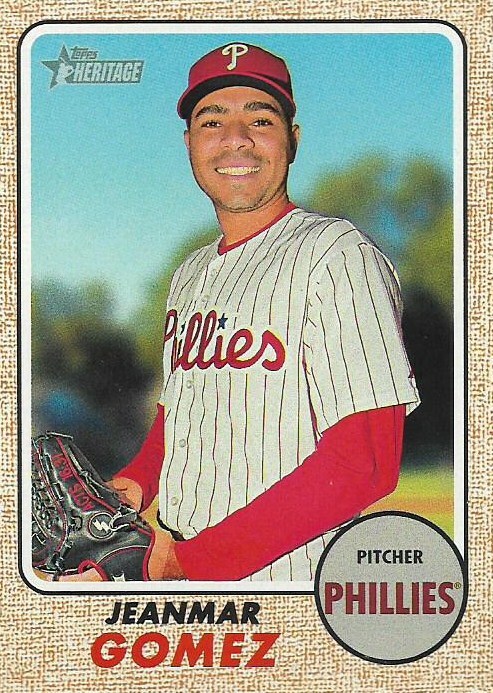 Just DFA'd this week by the awful, awful Phillies. Jorge Soler. 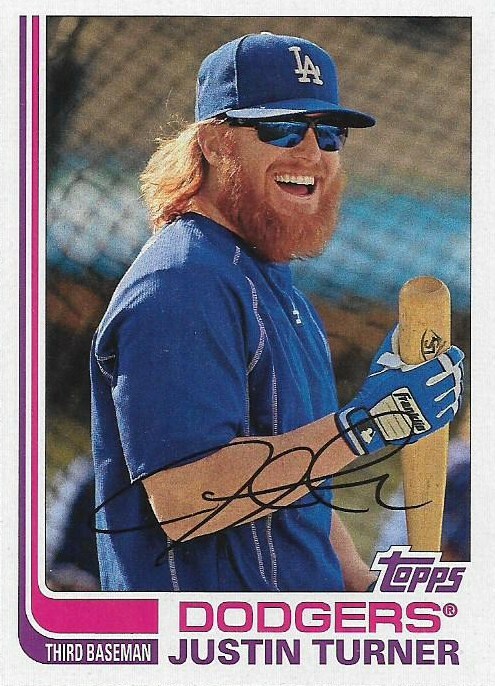 Sent down to Triple A Omaha by the Royals on June 3 after batting .164. Leonys Martin. 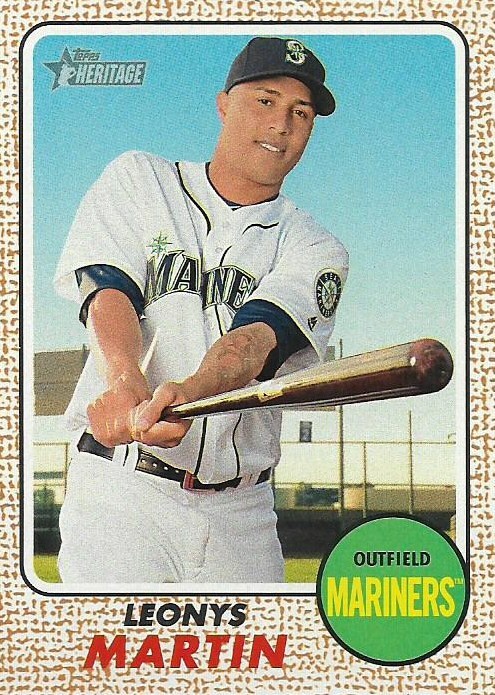 Has been playing for Triple A Tacoma this season. 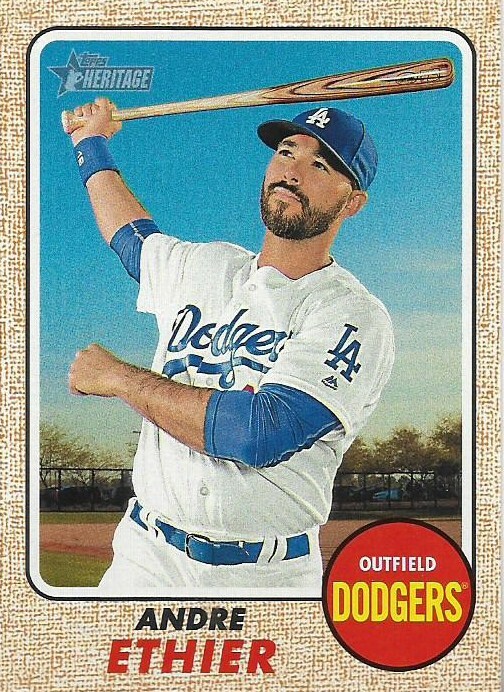 Andre Ethier. His season that was pushed back to after the All-Star break has now been pushed back to September. Edwin Jackson. 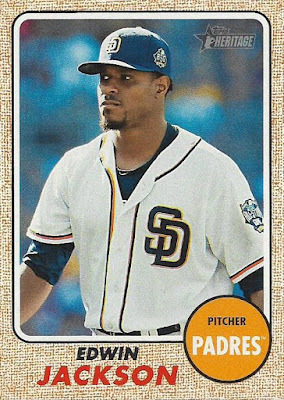 Has been with two teams since the Padres. Pitched in the minors for the Orioles, was just signed by the Nationals on a minor league deal. I didn't scan the doubles out of the packs, but neither Trayce Thompson (Dodgers) or Garrett Richards (Angels) are playing for their Heritage teams. Even some of these guys are tentative. Musgrove has been DL'd recently and hasn't pitched great. It's only a matter of time before Ricky Nolasco disappears from the Angels starting staff. Charlie Blackmon, of course, is the lone SP in the group because all of the superstars are stashed in the SPs these days, which is probably the big reason why Heritage packs are filled with so many iffy dudes. Are you ready for some MORE football?